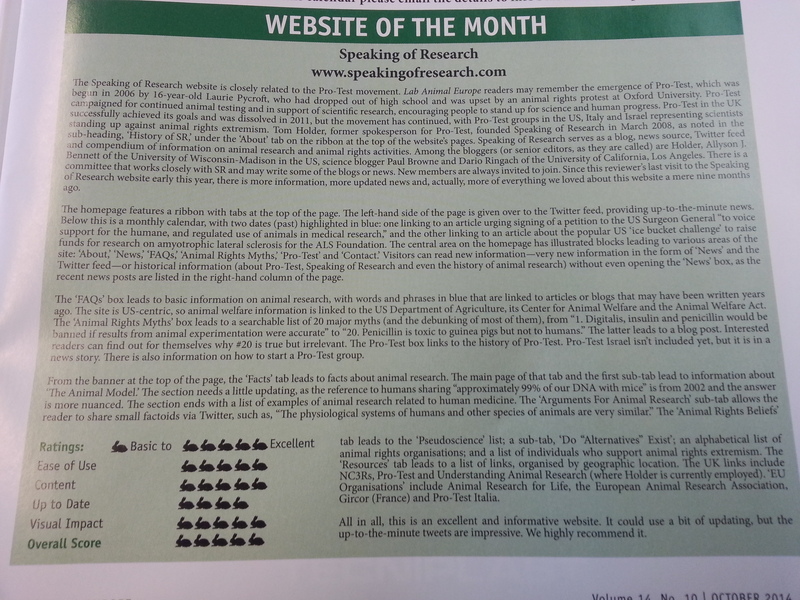 A few months after the Speaking of Research website got full marks in a recent review we’ve done it again. In Lab Animal Europe‘s Website of the Month, Speaking of Research got an overall score of five out of five and was considered ‘Excellent’ for Ease of Use, Content and Visual Impact. All, in all, this is an excellent and informative website. […] We highly recommend it. A big thanks to Lab Animal Europe for the review and we’ll keep trying to add “more information, more updated news, and, actually, more of everything we loved about this website“. Posted on October 17, 2014 by EditorPosted in News, SR in the Media, SR NewsTagged Lab Animal Europe, Speaking of Research website, Website of the Month.